Addressing a rally in Suratgarh a day after declaring his party would roll out a minimum income guarantee scheme for the poorest 20 per cent households if voted to power, Gandhi said only the rich could dream under the Narendra Modi rule. “We will eradicate poverty in the country. This is a ‘dhamaka’. No country has done this in history. There should not be a single poor person in the country,” Gandhi said. He said his party would work to reduce unemployment if it comes to power. “If Modi gives money to the rich, the Congress will give money to the poor,” Gandhi said. According to him, 14 crore people were lifted from poverty by the UPA government. “It is a shame that there are still 25 crore poor people in the country,” Gandhi said. “You will get the right price for your labour and product,” he told the gathering. The UPA government had launched schemes over 10 years but Modi ended them all, the Congress chief said, adding that the prime minister had failed to understand the MGNREGA job scheme. Taking a jibe at Modi, he said the prime minister was indeed a “chowkidaar” but of industrialist Anil Ambani. We will eradicate poverty in the country. This is a ‘dhamaka’. No country has done this in history. There should not be a single poor person in the country,” Gandhi said. He said his party would work to reduce unemployment if it comes to power. “If Modi gives money to the rich, the Congress will give money to the poor,” Gandhi said. 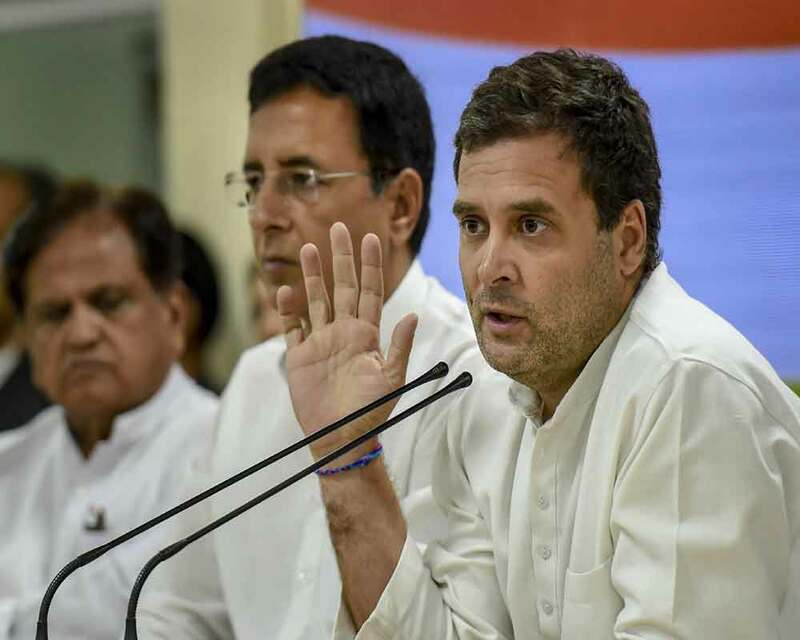 Alleging that Modi had helped those who had black money, the Congress president said those lifted from poverty by the UPA government had again been made poor in the last five years. According to him, 14 crore people were lifted from poverty by the UPA government. “It is a shame that there are still 25 crore poor people in the country,” Gandhi said. Congress leader Ajay Maken has resigned as the party’s Delhi unit president, citing health reasons. The resignation was accepted by Congress national president Rahul Gandhi on Thursday evening, sources said. According to a senior Delhi Congress leader, Mr. Maken called on Mr. Gandhi at 4:30 p.m. on Thursday, urging him to allow him to be relieved due to ill health. “I am very thankful for the love and respect I received from party workers, the media and national president Rahul Gandhi, as Delhi Congress president from the year 2015, and the four years since. It wasn’t easy working in such difficult circumstances; much gratitude from the bottom of my heart”. The resignation, according to the Delhi Congress leader, wasn’t submitted afresh and the decision to relieve Mr. Maken was taken on the basis of a request he made in late 2018. The party source claimed Mr. Maken was en route back to the All India Congress Committee (AICC) for the Lok Sabha polls. “I am very thankful for the love and respect I received from party workers, the media and national president Rahul Gandhi, as Delhi Congress president from the year 2015, and the four years since. It wasn’t easy working in such difficult circumstances; much gratitude from the bottom of my heart,” Mr. Maken said on Twitter. Till this announcement, the leader said, Mr. Maken would remain the working president of the Delhi Congress. Congress president Rahul Gandhi today released the party’s election manifesto for the Karnataka Assembly polls that promises creation of one crore jobs over five years. Gandhi described the manifesto as the “voice of the people of Karnataka” and not a document prepared by “three or four people in a closed room”. He also took potshots at Narendra Modi, saying while the prime minister likes to tell people his “mann ki baat”, this manifesto contained the “mann ki baat” of the people of Karnataka. Taking a dig at the BJP, Gandhi said the manifesto that the saffron party will release would not be for the people of Karnataka and reflect the views of the RSS. The Congress president claimed the the Siddaramaiah government had fulfilled 95 per cent of the promises made in the manifesto released ahead of the 2013 polls after coming to power. Elections to the 225-seat assembly are scheduled for May 12. Congress president Rahul Gandhi today released the party’s election manifesto for the Karnataka Assembly polls that promises creation of one crore jobs over five years. Gandhi described the manifesto as the “voice of the people of Karnataka” and not a document prepared by “three or four people in a closed room”. He also took potshots at Narendra Modi, saying while the prime minister likes to tell people his “mann ki baat”, this manifesto contained the “mann ki baat” of the people of Karnataka. Taking a dig at the BJP, Gandhi said the manifesto that the saffron party will release would not be for the people of Karnataka and reflect the views of the RSS. The Congress president claimed the the Siddaramaiah government had fulfilled 95 per cent of the promises made in the manifesto released ahead of the 2013 polls after coming to power. Elections to the 225-seat assembly are scheduled for May 12. Narendra Modi reaches BJP rally venue. To deliver speech anytime now. All eyes on the PM to see if he touches upon the Mahadayi issue. Kannada activists to stay put at Freedom Park till the end of speech. Lakhs of people gather at the venue to listen to the PM. Narendra Modi takes the stage. S.M. Krishna exchanges pleasantries with the PM. Modi is also accompanied by B.S. Yeddyurappa and Union Minister H.N. Ananth Kumar. BJP State president B.S. Yeddyurappa address the gathering. Mr. Yeddyurappa refers to Nostradamus, who, he claims, had said several centuries ago that a strong leader will emerge from India and rule the world. “Modi has emerged now,” he said. Prime Minister Narendra Modi addressed the Parivarthana rally at Palace Grounds in Bengaluru. Stating that the end of Congress rule in Karnataka was near, the Prime Minister said that BJP will make Karnataka Congress-mukt in the upcoming elections. He made no mention of Mahadayi issue. The rally was organised to mark the culmination of the 85-day pre-election campaign in all the Assembly constituencies taken out by party State president B.S. Yeddyurappa. Tight security was in place for the PM’s visit to Bengaluru and police had diverted traffic for the rally. Narendra Modi finishes his speech expressing confidence that the State will elect BJP in the upcoming Assembly election to take it on a path of development. However, he makes no mention of Mahadayi dispute in the speech. The identity of Congress government is just 10%. No work gets done without a cut of 10%. A Congress minister has been accused of Benami assets. Sand mafia, transfer mafia and builder mafia are ruling the roost in the State. Speaking about the Steel Flyover project, Mr. Modi said some people wanted crores of rupees in the name of steel flyover. BJP should be credited with stopping it. Narendra Modi reaches out to farmers in his speech. “Farmers are my top priority and by top I mean Tomato, Onion and Potato.” Says Yeddyurappa has farmers in his heart. Highlights a number of schemes for farmers that his government will introduce if it comes to power. Do you see development matching those grants in the state? We need a BJP government in the State to take the state on the path to development. For Bengaluru, we are spending ₹ 17,000 crore for a 160 km network of suburban rail with 80 stations that will help 50 lakh commuters. Our government is working towards ease of living. The schemes have also benefited the people of Karnataka. if there is a same party government in the State, there won’t be any roadblocks from these benefits reaching people. Accusing Congress of not doing anything for the people, Mr. Modi says in the last 3.5 yrs what funds centre has given Karnataka those funds haven’t reached the people in the State. The Karnataka government is getting over ₹ 2 lakh crore and has seen a rise of over 118% compared to UPA time. Modi starts his speech in Kannada, greets people. Remembers Kempegowda, Kittur Chennamma, Sangolli Rayanna, Basaveshwara, Madara Chennaiah and Sir M. Visvewaraya.